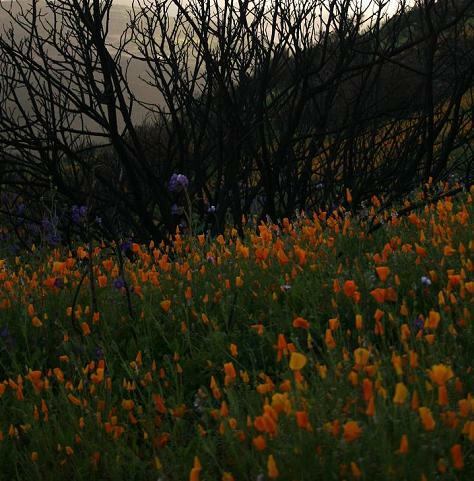 California Poppies, Purple Phacelias mixing with burned bushes, Del Dios Highway, Southwest of Lake Hodges. The smell and color of spring seems to be everywhere in San Diego right now, the burnt areas seem to be showing the most color. The Witch Creek Fire last October 2007 scorched most of the hills around Lake Hodges area. Five months ago, these hills were black and charred. 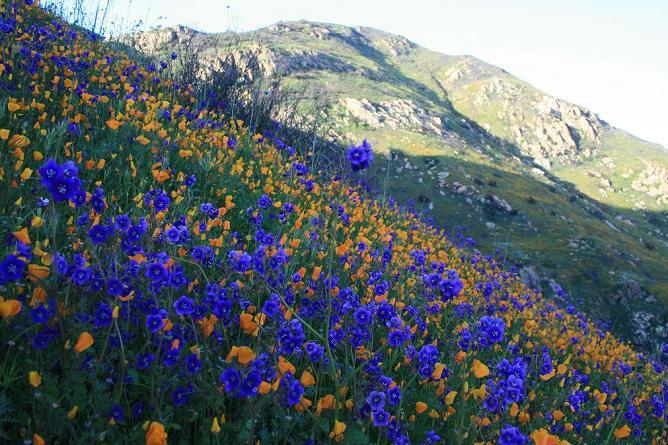 Now, the hills come alive with diverse display of color. A few months ago, there were fears of flash floods and mud slides in and around San Diego County, where the burnt areas and burnt hills are more susceptible to flooding because of the loss of vegetation and of the loosening of compaction of soil brought about by the wildfire that had sent thousands of San Diegans to flee their homes and seek refuge elsewhere. Thankfully, the rains did not come really heavy as to realize those fears, but just enough scattering to soak the hills, bringing back vegetation again. 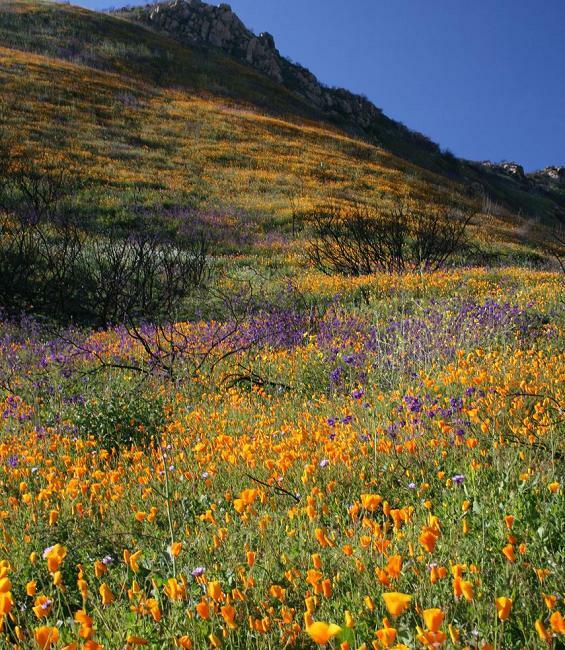 Now, the hills are not only recovering fast, but they appear to be amazingly charming, filled with vibrant colors from a diverse display of wildflowers bringing a dream-like scent into the air. 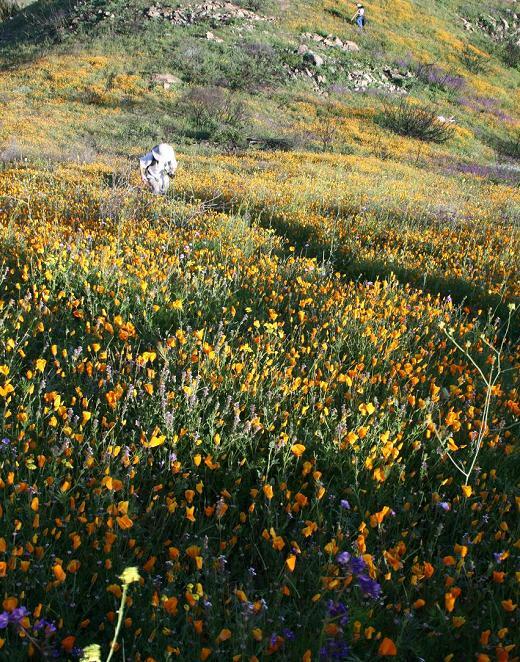 Knowing that the last spectacular wildflower bloom was in 2005 and rain does not come often in this semi-arid land, we are trying to make the most of the wonderful spring bloom this year. 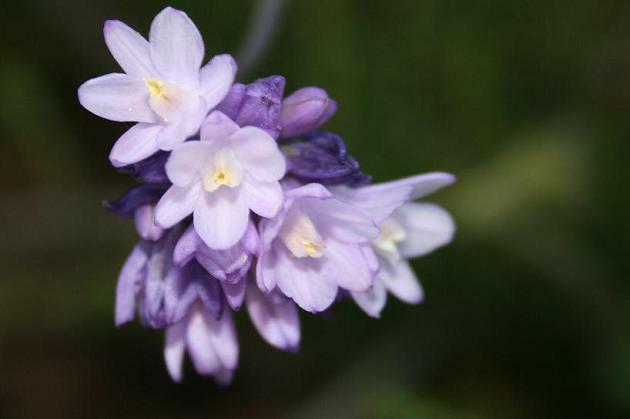 Especially that we do not know when the next amazing wildflower bloom will come. Last Thursday afternoon, we went to explore the hills above Lake Hodges after learning of the wonderful wildflower bloom there. 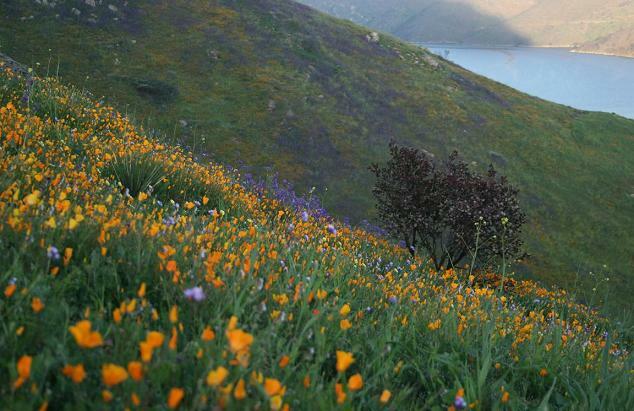 However, accessing the colorful hills above Lake Hodges poses parking difficulty. The colored hills are on the West side of Del Dios Highway. The amazing colorful hills go for miles, but very hard to find a spot to park. Paring is actually limited to small turn-outs, and they are very limited. There was a wider dirt turn-out along the east side of Del Dios Highway that can be mistaken as parking space, however, there was a sign that says, “No Parking”. There is a tiny pull-out opposite to it that has dirt road going up the colored hill. Even though the dirt turn-out on the East side of the highway looks a lot wider with some cars parked as well, but we were afraid of the no parking sign and also, afraid to cross the highway with fast running cars in both directions. We decided to make a U-turn and parked on the opposite side, which is a narrower dirt pull-out. Parking and pulling out from the area really requires careful caution. The dirt road up the hill is steep, yet gentler compared to what follows after, that is if you aim to reach the rocky top of the hill. After the dirt road ends, there is a narrower trail up to a level landing which is thickly carpeted by poppies. A nice place to start enjoying the widlfowers. We got to this area late afternoon and the poppies were no longer fully opened-up. 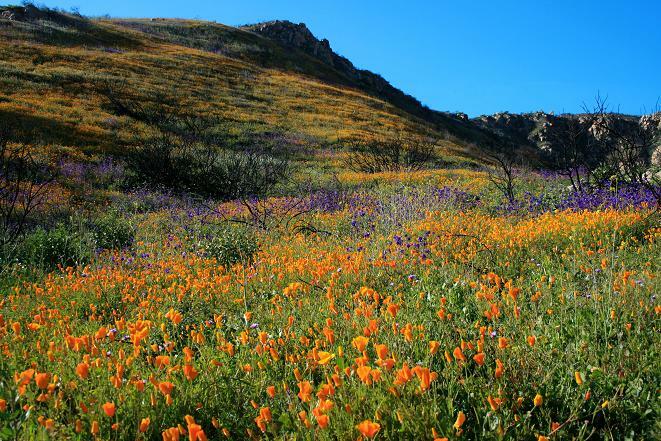 If you plan to not only hike and experience this great wildflower bloom but also take pictures of poppies fully opening up, you have to choose a warmer sunny day, but do not delay it too much that you will miss the bloom. After this level landing, there are several branching really narrow hiking trails that goes farther up probably created by previous hikers who went all the way to the top or may have been created naturally by water run-offs. These trails go really steep on some area, climbing up was easier than going down. 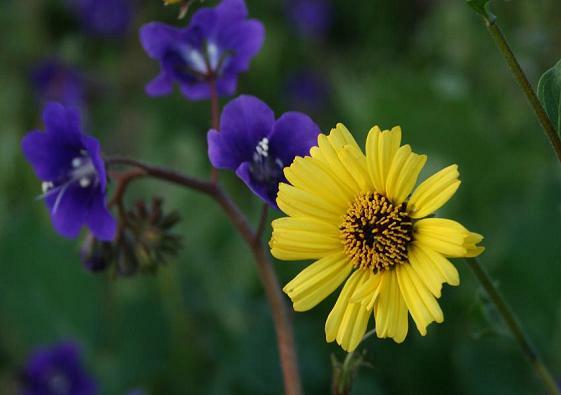 As you near the top, the poppies become thinner while the phacelias and sunflower becomes thicker. there were a lot of cute purple lilies that were just starting to bloom at the lower part of the hill. It is hard to miss these tiny lilies since they tend to bunch also together. These hills are really exploding with colors right now. If you want to get amazed with this wonderful gift from nature, and fill your dreams with color and fragrance, you’ve got to start moving your feet now to where the hills and canyons are. 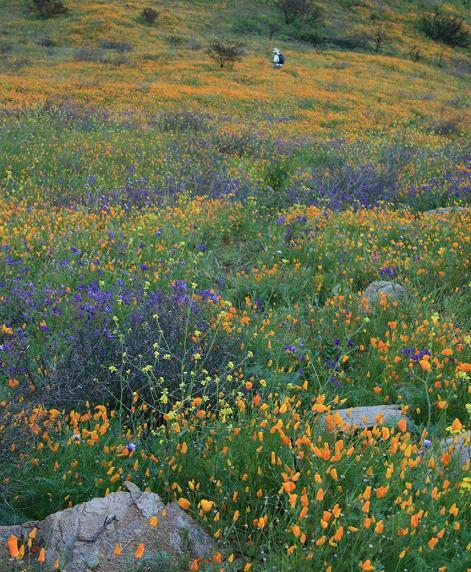 Hoping you have a wonderful hike with the wildflowers, making the field of dreams a field of colorful reality! Have fun, grab this priceless chance and enjoy the sun. Entry filed under: hiking, lake hodges, nature, poppy field, san diego, wildflowers. Your pictures are absolutely beautiful. You have quite the photographer’s eye! I was hoping to catch some wildflowers this weekend. Can you please email directions to Tooth Rock trail? Also, I don’t know the Lake Hodges area very well. 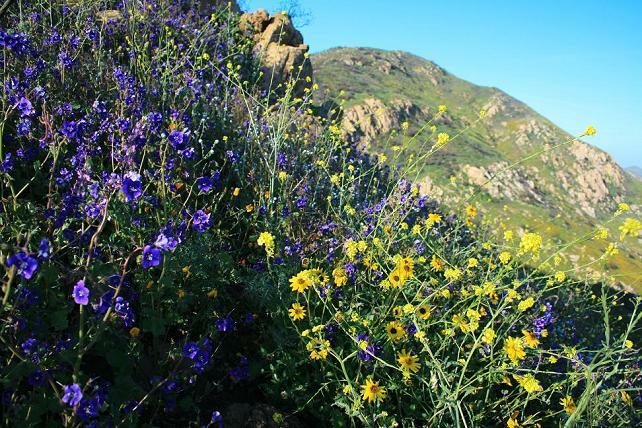 To see the flowers down there do you suggest just finding a spot to park on Del Dios Highway and then walk over to the Lake and where the flowers are? I don’t know how far the Highway is from the Lake and the flowers. Thanks for the kind words. I love hiking and our wonderful earth, thus as much as possible I capture pictures of the great outdoors to cultivate an interest for the natural wonders and an awareness that earth needs us to take care of itself. Actually, you won’t be walking over to the Lake, but on the hills opposite the lake. Yes, parking would be a challenge, as it will be on Del Dios Highway, you just have to look for dirt pull-outs to park. There is one larger dirt turn-out opposite the hills adjacent the dam, but you have to cross the street which is kind of dangerous. I will email you the rest of the directions. I can’t tell you how much I wish I was in California! Thanks for the beautiful photos. Thanks so much, Katie. I wish you well.